The live attenuated yellow fever virus (YFV) 17D vaccine provides a good model to study immune responses to an acute viral infection in humans. We studied the temporal dynamics, composition, and character of the primary human T cell response to YFV. The acute YFV-specific effector CD8 T cell response was broad and complex; it was composed of dominant responses that persisted into the memory population, as well as of transient subdominant responses that were not detected at the memory stage. Furthermore, HLA-A2– and HLA-B7–restricted YFV epitope–specific effector cells predominantly displayed a CD45RA−CCR7−PD-1+CD27high phenotype, which transitioned into a CD45RA+CCR7−PD-1−CD27low memory population phenotype. The functional profile of the YFV-specific CD8 T cell response changed in composition as it matured from an effector- to a memory-type response, and it tended to become less polyfunctional during the course of this transition. Interestingly, activation of CD4 T cells, as well as FOXP3+ T regulatory cells, in response to YFV vaccination preceded the kinetics of the CD8 T cell response. The present results contribute to our understanding of how immunodominance patterns develop, as well as the phenotypic and functional characteristics of the primary human T cell response to a viral infection as it evolves and matures into memory. The ideal immune response to a viral infection is initiated by a strong and appropriately balanced innate response that contains viral replication, followed by a highly specific adaptive response that seeks out and eliminates the invading pathogen. In the best of all situations, this occurs without persistent damage to the host, without development of chronic infection or inflammation, and with the establishment of protective immunological memory to subsequent encounters with the virus. In reality, however, many immune responses are less successful. Infections with pathogens, such as HIV-1 or hepatitis C virus, become chronic and are associated with persistent immune responses that contribute to immunopathology (1–3). In contrast, infections with viruses of the Flavivirus genus, such as the yellow fever virus (YFV), can be associated with acute immunopathology, including life-threatening viral hemorrhagic fever (4). YFV infection causes an estimated 200,000 illnesses and 30,000 deaths yearly, and ∼90% of these infections occur in Africa (5). The vast majority of YFV cases are preventable, because an effective vaccine was developed in the 1930s after successful attenuation of the YFV Asibi strain (6). The YFV vaccine has received renewed attention because of its high efficacy and safety (5) and because it provides a model for studies of human immune responses to a mild, but nevertheless replication-competent, acute viral infection (7–9). Primary antiviral T cell responses go through a phase of rapid proliferation and expansion of Ag-specific T cell clones. Murine models, such as the comprehensively studied immune response against lymphocytic choriomeningitis virus, showed that, during the peak of the response, a majority of CD8 T cells can be specific for the infecting virus (10, 11). This massive response then contracts into a much smaller memory population after viremia is controlled and the infection has been cleared. Murine models have also been instrumental in the understanding of the patterns of immunodominance in Ag-specific responses, where complex responses composed of several distinct epitope specificities establish hierarchies of dominant, subdominant, and cryptic responses (12, 13). To a large extent, studies of human T cell responses to viral infections have focused on pathogens causing chronic infections with wide implications for human health, such as HIV-1, EBV, hepatitis C virus, and CMV (14–20). In this context, surface receptors and markers, such as CD45 isoform, and homing receptors CCR7 and CD62L were proposed to identify T cell differentiation stages, identifying CD45RA+CCR7+ cells as naive, CD45RA−CCR7+/− cells as memory, and cells reverting to CD45RA expression without CCR7 as late-stage effector cells (21, 22). However, a recent study by Akondy et al. (23) showed that CD8 T cells against an HLA-A2–restricted YFV epitope displayed a predominantly CD45RA− phenotype during the effector response, whereas it was CD45RA+ at the memory stage. These findings illustrate the value of studies of primary infection models, such as the YFV 17D vaccine, for obtaining a better understanding of human T cell responses to this specific virus, as well as viral infections in general. In the current study, we adopted the YFV 17D model to further study the specificity, breadth, functional and phenotypic characteristics, and immunodominance patterns in the primary T cell response to this acute viral infection. T cells in the CD8, CD4, and FOXP3+ regulatory T cell (Treg) compartments all responded to YFV, and the kinetics of CD4 and Treg responses preceded the CD8 T cell response. The CD8 T cell response against a range of YFV candidate epitopes was broad and complex, composed of both dominant responses that persisted into the memory population, as well as of transient subdominant responses that were not detected at the memory stage. Furthermore, HLA class I tetramer–defined YFV-specific effector cells predominantly displayed a CD45RA−CCR7−PD-1+ phenotype that transitioned into a CD45RA+CCR7−PD-1− memory phenotype. The functional profile of the CD8 T cell response changed composition as it matured and tended to become less polyfunctional in the transition from the effector to the memory stage. In conclusion, the results presented in this article add to our understanding of how the primary human T cell response to viral infection evolves and matures into memory. Twenty-one healthy volunteers ranging from 18 to 50 y of age were recruited into the study after informed consent. Approval of procedures was obtained from the Regional Ethical Review Board in Stockholm. A single dose of yellow fever vaccine strain 17D (Stamaril; Sanofi Pasteur) was administered s.c., and blood samples were obtained just before vaccination (baseline) and at days 10, 15, and 90 after vaccination. PBMCs were purified by Lymphoprep-gradient centrifugation (Axis-Shield, Dundee, U.K.), according to standard protocols, and cryopreserved in 90% FCS and 10% DMSO. Candidate epitopes presented by any of the HLA-A1, -A2, -A3, -A24, -B7, and -B8 supertypes were predicted using the NetCTL search engine (version 1.2) (24, 25). The HLA class I epitope predictions were performed using a dataset consisting of the YFV 17D-204 strain available in the Flavitrack database (http://carnot.utmb.edu/flavitrack). Seventy-eight peptides were predicted, and the 10–12 top-scoring peptides in each HLA supertype were selected for synthesis. Peptides were synthesized by standard 9-fluorenyl-methyloxycarbonyl chemistry, purified to 90% purity by reverse-phase HPLC, and validated by mass spectrometry (JPT Peptide Technologies, Berlin, Germany). T cell responses to YFV were assessed using multicolor flow cytometry (26). The following mAbs and HLA-tetramers were used in flow cytometry: anti-CD4 Pacific Blue, anti-CD8 PerCP, anti-CD3 PE-Cy7, anti-CD27 FITC, anti–HLA-DR PerCP, anti-Ki67 FITC, anti-CCR7 PE-Cy7, anti–IFN-γ FITC, anti–MIP-1β PE, anti–TNF-α PE-Cy7, anti-CD107a biotin, anti–IFN-γ allophycocyanin, and anti–IL-2 allophycocyanin were all from BD Biosciences (San Jose, CA). Anti-FOXP3 Alexa Fluor 660, anti-CD38 Alexa Fluor 700, anti-CD127 Alexa Fluor 700, anti–programmed death-1 (PD-1) (CD279) PE, and anti-CD25 PE-Cy7 were from eBioscience (San Diego, CA). Anti-CD14 Qdot 525, anti-CD19 Qdot 525, Qdot 605 streptavidin, anti-CD8 Qdot 705, Near-IR LIVE/DEAD, and Aqua LIVE/DEAD were from Invitrogen (Carlsbad, CA). HLA-A2 NS4b LLW, HLA-B7 NS5 RPI, and HLA-A24 NS1 VYM tetramers in allophycocyanin and anti-CD3 ECD were from Beckman Coulter (Brea, CA). Anti-CD45RA was from BioLegend (San Diego, CA), and anti-CD3 Cascade Yellow was from Dako (Glostrup, Denmark). For phenotypic analysis of cells, incubation for 15 min at room temperature with HLA tetramer alone was followed by 30 min at 4°C in the dark with surface mAbs. This was followed by washing with PBS and fixing in 1% paraformaldehyde. For intracellular staining of Ki67 and FOXP3, cells were fixed and permeabilized with Fix/Perm (eBioscience) for 30 min at 4°C in the dark. Flow cytometry data were acquired on a CyAn ADP instrument (Beckman Coulter) or a BD LSRFortessa (BD Biosciences) and analyzed using FlowJo software version 8.8.6 or 9.1 (TreeStar, Ashland, OR) and SPICE 5.1 software provided by Dr. M. Roederer (National Institutes of Health, Bethesda, MD). PBMCs were thawed and rested in RPMI 1640 medium containing 10% FCS, 2 mM l-glutamine, 1% penicillin, and streptomycin (Invitrogen) overnight at 37°C. Cells were stimulated with 10 μg/ml peptides for 6 h in 96-well round-bottom plates in the presence of brefeldin A (Sigma-Aldrich, St. Louis, MO), monensin (BD Biosciences), and purified anti-CD28/CD49d (1 μl/ml; BD Biosciences). For mapping of T cell epitopes, freshly isolated or thawed PBMCs were labeled for 5 min with 1 μM CFSE (Molecular Probes) in PBS at 37°C. Cells were washed extensively with RPMI 1640 plus 10% FCS. CFSE-labeled cells were then incubated or not with single peptides (4 μg/ml) in the presence of IL-2 (20 IU/ml) for 6 d. At the end of culture, cells were restimulated for 12 h with the same peptide (4 μg/ml) in the presence of brefeldin A (Sigma-Aldrich) and anti-CD28/CD49d (1 μl/ml). Staining, flow cytometry, and analyses were performed as described above. Genomic DNA was isolated from whole blood using the DNeasy kit (QIAGEN). HLA typing was performed using a multiplexed reverse sequence-specific oligonucleotide probe method (LABType SSO; One Lambda), according to the manufacturer’s instructions. Statistical analyses were performed using GraphPad Prism software 5.0 for Mac OS X (GraphPad Software, La Jolla, CA). Data were analyzed by nonparametric repeated-measures ANOVA. The p values < 0.05 were considered statistically significant. T cell activation and proliferation can be assessed simultaneously to estimate the overall magnitude of an ongoing T cell response (9, 27). In this study, surface expression of CD38, in combination with intracellular expression of Ki67, was used to determine the frequency of responding CD8 and CD4 T cells before and on days 10, 15, and 90 after YFV vaccine administration to healthy, previously unvaccinated individuals (Fig. 1A). Baseline levels of CD38 and Ki67 coexpression were low; they expanded 10–15-fold on days 10 and 15 after vaccination and subsequently returned to baseline values by day 90, consistent with an effector-response population contracting into a memory population. Interestingly, the CD4 T cell response, as detected by CD38 and Ki67, preceded the CD8 T cell response (Fig. 1B, 1C). Thus, vaccination with the live attenuated YFV 17D vaccine, consistent with previous reports (9, 28, 29), generated sizeable CD8 T cell and CD4 T cell responses. Magnitude and kinetics of CD4 and CD8 T cell activation in response to the YFV vaccine. (A) CD38 and Ki67–coexpressing cells in CD8 and CD4 T cell populations over time in vaccinated subjects. (B) Median and 10–90th percentiles of CD38 and Ki67 coexpression in CD8 T cells at baseline and at days 10, 15, and 90 in vaccinated subjects (n = 10). (C) Median and 10–90th percentiles of CD38 and Ki67 coexpression in CD4 T cells at baseline and days 10, 15, and 90 in vaccinated subjects (n = 10). Statistical analysis was performed using nonparametric repeated-measures ANOVA. *p < 0.05, **p < 0.01, ***p < 0.001. To study the T cell response to YFV in more detail, we next set out to identify epitopes recognized in the primary response after vaccination. Seventy-eight possible YFV epitope candidates predicted to be presented by HLA-A1, -A2, -A3, -A24, -B7, or -B8 were identified using the NetCTL search engine and selected for further study (Supplemental Table I) (Fig. 2). To assess the existence of CD8 T cell responses against these peptide sequences, CFSE-labeled PBMCs from 13 of the 21 recently vaccinated volunteers were cultured with the corresponding synthetic peptides for 6 d. By the end of day 6, these cultures were restimulated for 12 h in the presence of peptide, and responses were determined by intracellular staining for IFN-γ (Fig. 2). Responding cells were identified as double positive for CFSE dilution, indicative of proliferation during culture with peptide, and IFN-γ production > 0.5% by CD8 T cells in response to restimulation. By this measure, a CD8 T cell response was detected against 57 of the 78 tested (73%) candidate epitopes in at least one donor. Thus, the effector stage of the CD8 T cell response against YFV 17D is both broad and diverse. YFV epitope identification methodology. Schematic procedure for the prediction and selection of YFV 17D epitopes. Seventy-eight candidate epitopes presented by HLA-A1, -A2, -A3, -A24, -B7, and -B8 were predicted using the NetCTL 1.2 search engine. Assessment of responses against synthetic peptides corresponding to the 78 predicted epitopes was performed using a 6-d culture in the presence of peptide, followed by a 12-h restimulation. After restimulation, epitope-specific cells were identified as CFSElowIFN-γhigh. The 12 peptides that induced responses in ≥4 of 13 individuals were selected for further study. Three of the peptides that induced detectable IFN-γ responses in a 6-h in vitro assay were selected to make HLA-A2 NS4b LLW, HLA-A24 NS1 VYM, and HLA-B7 NS5 RPI tetramers. Twelve of the seventy-eight candidate epitopes gave positive responses in ≥4 of the 13 subjects, and these 12 peptides were selected for further study in all 21 vaccinated subjects (Table I). Three of the more strongly targeted epitopes, which could also be assigned HLA restriction based on the HLA type of responding subjects, were selected for HLA-tetramer synthesis. 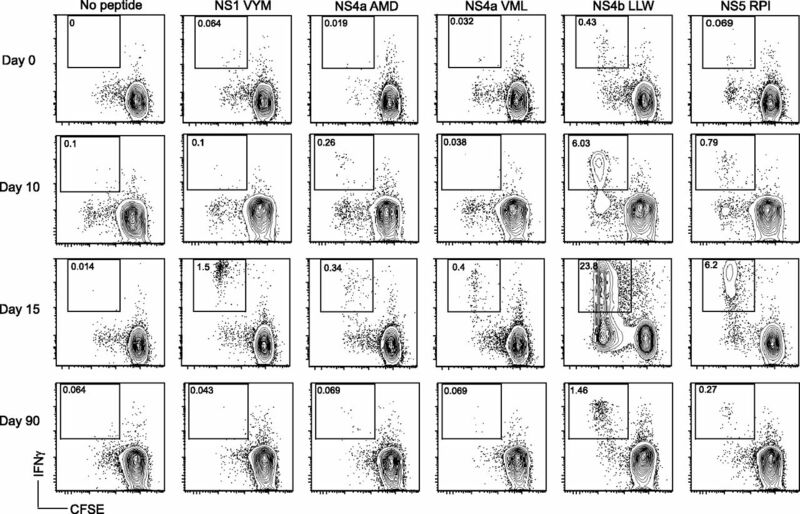 Tetramer staining confirmed the presence of CD8 T cells specific for these epitopes in YFV-vaccinated donors (Fig. 2). Together, these results identify a set of YFV epitopes targeted in vaccinated healthy subjects and demonstrate that YFV generates a broad CD8 T cell response. The maturation of immunodominance patterns in primary CD8 T cell responses to acute virus infections in man is incompletely described. Thus, we set out to study this aspect of the response to YFV using the sensitive 7-d expansion and restimulation methodology to assess the presence of CD8 T cells specific for the 12 epitopes throughout the course of the study (Fig. 3). The magnitude of responses against targeted epitopes differed markedly, with the HLA-A2–restricted response to the NS4b LLW epitope standing out as the most strongly targeted, as observed previously (23). In addition, the HLA-B7–restricted response to the NS5 RPI epitope also stood out as dominant in both effector and memory stages. Many other specific responses were less strong, but still clearly detectable, during both effector and memory stages of the response. Interestingly, some responses displayed a transient effector nature: they were clearly detectable at day 15 but were undetectable at day 90. One such example is the NS1 VYM epitope in the representative subject shown in Fig. 3. Together, these results suggest that epitope-specific CD8 T cell responses generated against YFV display a range of differential magnitude and duration, with some specificities contributing strongly and others barely at all, to the YFV memory CD8 T cell pool. The CD8 T cell response is composed of both dominant persisting and subdominant transient responses. PBMCs isolated from one representative donor at baseline and at days 10, 15, and 90 were cultured with single peptides for 6 d, followed by a 12-h restimulation with the same peptide in the presence of brefeldin A and purified anti-CD28/CD49d. Responding cells were identified as CFSElowIFN-γhigh. 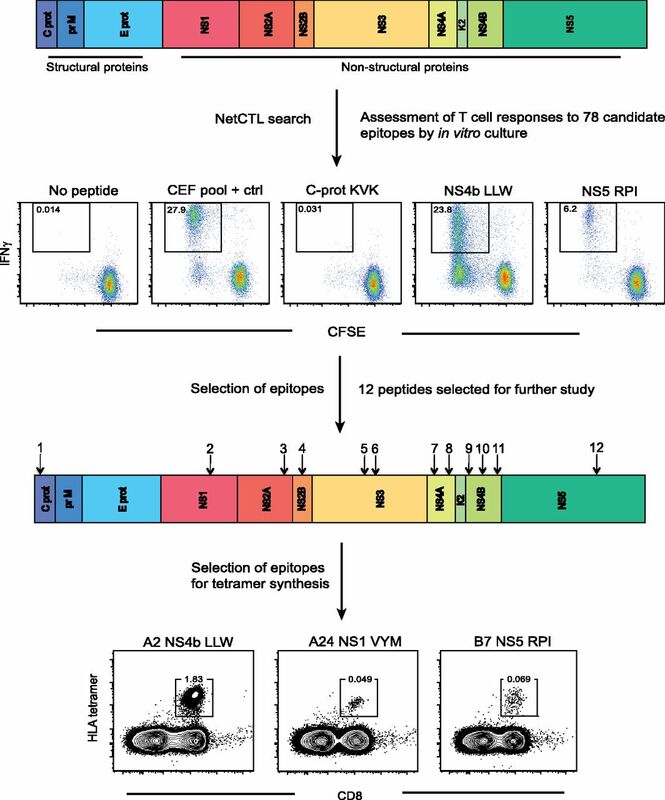 To further characterize YFV epitope–specific CD8 T cells, we generated HLA class I tetramers for the HLA-A2–restricted NS4b LLW epitope, the HLA-B7–restricted NS5 RPI epitope, and the HLA-A24–restricted NS1 VYM epitope (Fig. 2). The HLA-A2 and -B7 tetramers were sufficiently stable and had detectable frequencies in a sufficient number of donors to allow careful enumeration and phenotypic characterization of specific CD8 T cells during the course of the response to YFV (Fig. 4). CD8 T cells identified with these two tetramers were characterized for their expression of CCR7, CD45RA, PD-1, and CD27 (Fig. 4A). The dominant NS4b LLW–specific response was clearly detectable at day 10 and reached frequencies of up to 7% of CD8 T cells (Fig. 4B). Furthermore, this response was observed by tetramer staining in all HLA-A2+ donors. The NS5 RPI-specific responses were detected in up to 0.35% of CD8 T cells in HLA-B7+ donors (Fig. 4C). This response was observed by tetramer staining in all HLA-B7+ donors tested. During the effector response at day 15, the most prevalent phenotype of tetramer-defined CD8 T cells of both specificities was positive for PD-1 and negative for CCR7 and CD45RA (Fig. 4B, 4C). At the memory stage at day 90, this PD-1+CD45RA− phenotype had shifted toward a loss of PD-1 and re-expression of CD45RA. Only a very small fraction of tetramer-positive cells expressed CCR7 throughout the course of the study. Establishment of this memory CD8 T cell phenotype was also accompanied by a degree of surface downregulation of CD27, measured as mean fluorescence intensity, although cells clearly remained positive. 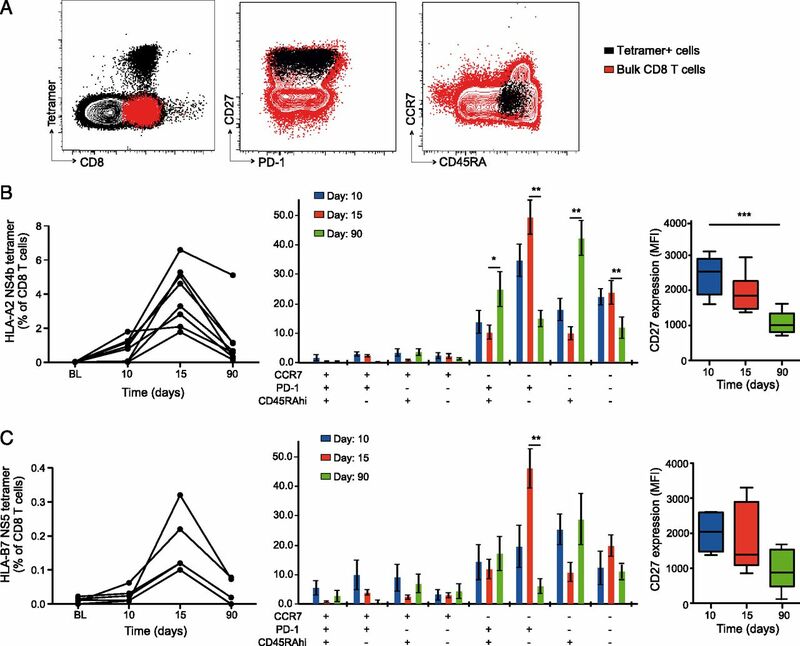 Together, these data demonstrate how the YFV-specific CD8 T cell response goes through maturation of the prevalent PD-1+CD45RA− effector character into a PD-1−CD45RA+ phenotype with the establishment of T cell memory. Phenotype of HLA-A2 and HLA-B7 tetramer-defined CD8 T cell populations. (A) Identification of YFV-specific CD8 T cells. Total CD8 T cells are shown in red, and YFV-specific cells are shown in black. (B) Kinetics of the HLA-A2 NS4b LLW–specific CD8 T cell response (left panel). Bar chart shows subset distribution of the tetramer-specific T cells. Bars represent occurrence of a particular subset as the percentage of the parent populations (middle panel). Box-and-whisker plot shows the median and 10-90 percentile of mean fluorescence intensity of CD27 expression in the HLA-A2 NS4b LLW–specific cells (right panel). (C) Kinetics of HLA-B7 NS5 RPI–specific CD8 T cells (left panel). Bar chart represents the subset distribution of tetramer-specific cells (middle panel). Box-and whisker plot shows the median and 10–90th percentile of mean fluorescence intensity of CD27 expression in the HLA-B7 NS5 RPI–specific CD8 T cells (right panel). Statistical analysis was performed using nonparametric repeated-measures ANOVA. *p < 0.05, **p < 0.01, ***p < 0.001. Next, we studied the detailed functional profile of responding cells during the course of the primary CD8 T cell response to YFV. We studied degranulation (CD107a), cytokine expression (IFN-γ, IL-2, and TNF-α), and chemokine expression (MIP-1β) in CD8 T cells specific for the dominant HLA-A2–restricted NS4b epitope (Fig. 5A). The response pattern was diverse and dominated by mono-, bi-, and triple-functional cells (Fig. 5B). At the effector stage on day 10, bifunctional IFN-γ– and MIP-1β–producing cells dominated the response (Fig. 5C). This was the most common combination of two functions through day 90, although their overall contribution to the response decreased over time. At day 90, MIP-1β monofunctional cells were the overall most common functional profile and had replaced degranulation as the dominant monofunctional subset (Fig. 5C). 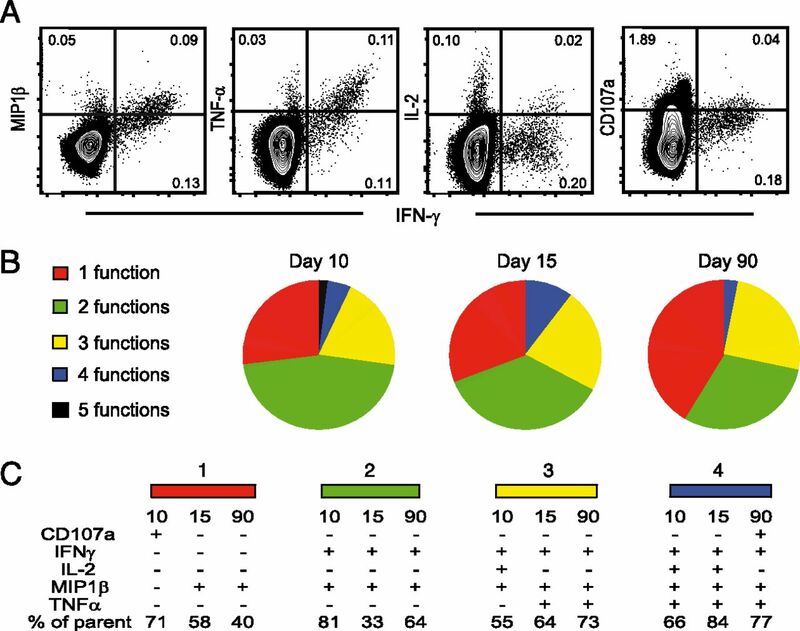 Triple-functional cells maintained a steady proportion of the response, although the composition changed over time (IFN-γ, IL-2, MIP-1β at day 10 to IFN-γ, MIP-1β, TNF-α at day 90) (Fig. 5C). A minor subset displayed four functions; the relative size of this subset was reduced, and it changed composition from IFN-γ, IL-2, MIP-1β, TNF-α at days 10 and day 15 to CD107a, IFN-γ, MIP-1β, TNF-α at day 90 (Fig. 5C). Cells coexpressing five functions were rarely detected. These results indicate that the YFV NS4b–specific CD8 T cell response changes composition as it matures from an effector- to a memory-type response and, surprisingly, becomes a little bit less polyfunctional in this transition. Functional profile of YFV-specific effector and memory T cell responses. (A) PBMCs from vaccinated subjects were stimulated for 6 h with NS4b LLW peptide in the presence of brefeldin A and monensin, and intracellular expression of MIP-1β, IL-2, IFN-γ, and TNF-α, as well as the cell surface expression of CD107a, was assessed by flow cytometry. (B) Pie charts indicate the mean composition of the total response in CD8 T cells with regard to their capacity to express one, two, three, four, or five functions at days 10, 15, and 90 after vaccination with YFV-17D. (C) Dominant polyfunctional profiles at days 10, 15, and 90. The percentage of the parent populations is indicated for each dominant population. Tregs provide part of the natural regulatory-feedback loop to control an immune response. Therefore, we analyzed the CD4+CD25+FOXP3+CD127− Treg population during the response to YFV (Fig. 6A). Treg levels were stable throughout the course of the study (Fig. 6B); however, there was clearly detectable activation, as measured by coexpression of CD38 and Ki67 in these cells at day 10 after vaccination (Fig. 6C). This activation was transient and essentially returned to background levels by day 15 and was accompanied by a decrease in PD-1 expression in Tregs (Fig. 6D). Thus, although the percentages of Tregs do not change during the primary response to YFV, there is transient activation of these cells. FOXP3+ Treg activation during the primary YFV-specific response. (A) Identification and gating strategy of CD4+CD25highFOXP3+CD127− Tregs. (B) Median and 10–90th percentiles of FOXP3+ regulatory CD4 T cells over time in vaccinated subjects (n = 10). (C) Median and 10–90th percentiles of CD38 and Ki67 coexpression in FOXP3+ regulatory CD4 T cells at baseline (BL) and at days 10, 15, and 90 in vaccinated subjects (n = 10). (D) Median and 10–90th percentiles of PD-1 expression in CD38 and Ki67–coexpressing Tregs at baseline (BL) and at days 10, 15, and 90 in vaccinated subjects (n = 10). Statistical analysis was performed using nonparametric repeated-measures ANOVA. *p < 0.05, ***p < 0.001. The YFV 17D vaccine has received renewed attention because it provides an excellent model for detailed studies of primary human immune responses against viral infections in a temporal manner (7–9). We adopted this model to study the specificity, functional profile, phenotypic characteristics, and immunodominance patterns in the primary T cell response to this acute viral infection. T cells in the CD8, CD4, and Treg compartments responded to YFV. The kinetics of CD4 T cell and Treg responses preceded the CD8 T cell response. The CD8 T cell response against a set of candidate YFV epitopes was broad and complex and was composed of both dominant and subdominant responses that persisted into the memory population, as well as of transient subdominant responses that were undetectable at the memory stage. Furthermore, HLA-A2 and -B7 tetramer–defined YFV-specific effector cells predominantly displayed a CD45RA−PD-1+ phenotype that transitioned into a CD45RA+PD-1− memory phenotype. The functional profile of the CD8 T cell response changed composition as it matured; surprisingly, it tended to become somewhat less polyfunctional in the transition to the memory stage. CD8 T cells can express a broad range of effector functions, which are rarely coexpressed in the same cell and with the same kinetics, resulting in considerable functional heterogeneity (18, 30–32). Studies of this heterogeneity are interesting because the qualities of T cell responses, as well as of individual T cells, may relate to the protection that they confer to the host. For instance, in the search for immunological correlates of immune control of chronic HIV-1 infection, it was observed that high levels of polyfunctionality in the CD8 T cell response to the virus were associated with slow disease progression (33, 34). However, the link between polyfunctionality and viral control is not straightforward. A recent report by Ferrari et al. (35) indicated that, during acute infection, the magnitude of the CD8 T cell response, rather than the level of polyfunctionality, correlates with selection of viral-escape mutants. In this context it is interesting to note that, according to our results, the immunodominant YFV NS4b LLW response is not particularly polyfunctional but rather is dominated by mono- and bifunctional cells. Because the YFV 17D vaccine affords a high level of protection, this observation would be consistent with a model in which polyfunctionality is not a strict requirement for a protective CD8 T cell response. Furthermore, we observed that the exact repertoire of functions changes over time as the response matures from an effector to a memory response. However, the tendency is that the representation of four- or five-functional cells decreases from day 15 to 90. Overall, MIP-1β monofunctional cells become the most common functional profile at day 90, consistent with the findings by Kim et al. (36), who observed strong chemokine production in late-stage memory cells. This again argues against a central role of polyfunctionality as an essential character in a protective-immune response; perhaps the total magnitude or qualitative aspects, such as the strength of response at the single-cell level, are more important (35, 37). A noteworthy characteristic of the CD8 T cell response to YFV is the breadth and diversity of the specificity of the effector response detected at day 15. To increase the likelihood of also detecting the weaker responses, we devised a culture-restimulation method by which we assessed responding cells that are CFSElow after the 6-d culture with peptide and IFN-γ+ after the 12-h restimulation. Of the 78 candidate epitopes initially identified using the NetCTL search engine, we observed a detectable response using this method in at least one donor to 57 of the 78 peptides. This probably reflects, in part, the diversity in HLA genotypes among donors, but it can also be viewed as an unexpected level of epitope diversity in the effector CD8 T cell response. For practical reasons, we limited the more extensive analysis to the 12 peptide epitopes targeted in several donors (Table I). Longitudinal analysis of these CD8 T cell responses revealed several interesting patterns. First, the immunodominant A2-restricted NS4b LLW epitope and the B7-restricted NS5 RPI epitope were recognized early and strongly in all donors carrying the respective HLA class I gene. These responses also persisted into the memory stage at day 90. For the NS4b LLW epitope, this pattern is consistent with that observed by Akondy et al. (23), and we observed that the response to the NS5 RPI epitope, first described in this study to our knowledge, follows a similar pattern. Interestingly, we observed small, but detectable, responses to the NS4b LLW epitope in three of nine HLA-A2+ donors at day 0 before vaccination (Fig. 3). This opens up the possibility that the immunodominant nature of this response might be influenced by cross-reactivity to other viruses. Second, responses to epitopes, such as NS4a AMD, were weak, but clearly detectable, throughout the course of study. This can be considered a classical subdominant response pattern. Finally, the NS1 VYM epitope appeared to be recognized transiently at the peak of the response but not at the memory stage; thus, it can be described as a transient subdominant epitope. It is important to note that responses not detected at the memory stage may still exist at very low frequencies or at a location other than in the peripheral blood. In phenotypic studies of tetramer-defined CD8 T cells specific for the NS4b LLW and NS5 RPI epitopes, we observed that the dominant phenotype is PD-1+CD27high, whereas it is CCR7−CD45RAlow during the effector response at day 15. At the memory stage on day 90, this phenotype has shifted to a dominant CD45RA+PD-1−CD27lowCCR7− phenotype. The major changes in the transition from effector to memory stages are CD45RA re-expression and loss of PD-1. Thus, it seems that PD-1 behaves primarily as an activation marker in this system. Furthermore, the previous description of CD45RA re-expression as a marker of late-stage effector cells is inconsistent with this pattern, because the YFV-specific populations detected at day 90 are, by definition, memory cells. In fact, we detected CD8 T cells with these specificities up to 4 y after vaccination, demonstrating that these cells can persist long-term (data not shown). The notion that CD45RA+CCR7− cells may be involved in providing protective immunity is supported by observations in HIV-1 infection: HIV-specific CD8 T cells with this phenotype were associated with control of viremia (38, 39). In addition to CD8 T cell responses, we measured responses to vaccination by CD38 and Ki67 coexpression in the CD4 T cell and FOXP3+ Treg compartments. Interestingly, responses in CD4 T cells appear to occur with faster kinetics, with the highest levels of CD38+Ki67+ cells at day 10, compared with day 15 in the CD8 T cell compartment. This pattern is consistent with observations in a recent study by Kohler et al. (40), in which a YFV-specific CD4 T cell response was already seen at day 7 using cytokine production as the means of detection. This strong and fast CD4 T cell response might be a central aspect of the high level of protection afforded by the YFV 17D vaccine, and it may depend on the ability to infect and activate dendritic cells, resulting in the subsequent efficient presentation of Ag (41, 42). The CD4 T cell response is likely to be important for the development of a high-quality humoral response to the vaccine. Although we did not address humoral immunity in the current study, it is known from YFV 17D vaccine dose-response studies in nonhuman primate models that a level of neutralizing Abs is required for protection against subsequent challenge (5, 43). The activation of FOXP3+ Tregs observed in the current study is interesting, and the mechanisms behind this activation, as well as the role that it plays in the generation of protective immunity, needs further investigation. Interestingly, a recent study in a mouse model of Listeria monocytogenes infection found that Tregs play an important role in shaping the primary CD8 T cell response toward an effective high-avidity response and establishment of CD8 T cell memory (44). In summary, we studied the specificity, functional profile, phenotypic characteristics, and immunodominance patterns in the primary T cell response to YFV 17D live attenuated viral infection. Our findings represent a significant contribution to the understanding of the composition and character of this T cell response as it evolves and matures from the effector to the memory stage. We thank the healthy volunteers who contributed time and effort related to sample donation for this study. This work was supported by the Swedish Research Council, the Swedish Cancer Society, the Stockholm County Council, and the Karolinska Institutet.
. 2009. Emerging concepts in the immunopathogenesis of AIDS. Annu. Rev. Med. 60: 471–484. 2009. Hepatitis C virus versus innate and adaptive immune responses: a tale of coevolution and coexistence. J. Clin. Invest. 119: 1745–1754.
. 2010. Innate immunity and chronic immune activation in HCV/HIV-1 co-infection. Clin. Immunol. 135: 12–25.
. 2011. Immune response to dengue virus and prospects for a vaccine. Annu. Rev. Immunol. 29: 587–619.
. 2010. Yellow fever vaccine: recommendations of the Advisory Committee on Immunization Practices (ACIP). MMWR Recomm. Rep. 59(RR-7): 1–27.
. 1936. Modifications of the virulence of yellow fever virus by cultivation in tissues in vitro. Trans. R. Soc. Trop. Med. Hyg. 29: 481–529. 2009. Learning immunology from the yellow fever vaccine: innate immunity to systems vaccinology. Nat. Rev. Immunol. 9: 741–747.
. 2011. Insights into human CD8(+) T-cell memory using the yellow fever and smallpox vaccines. Immunol. Cell Biol. 89: 340–345.
. 2008. Human effector and memory CD8+ T cell responses to smallpox and yellow fever vaccines. Immunity 28: 710–722.
. 1998. Massive expansion of antigen-specific CD8+ T cells during an acute virus infection. Immunity 8: 167–175.
. 1998. Counting antigen-specific CD8 T cells: a reevaluation of bystander activation during viral infection. Immunity 8: 177–187. 2006. Confronting complexity: real-world immunodominance in antiviral CD8+ T cell responses. Immunity 25: 533–543.
. 2012. Immunodominance: a pivotal principle in host response to viral infections. Clin. Immunol. 143: 99–115.
. 2002. Memory CD8+ T cells vary in differentiation phenotype in different persistent virus infections. Nat. Med. 8: 379–385.
. 1998. Direct visualization of antigen-specific CD8+ T cells during the primary immune response to Epstein-Barr virus In vivo. J. Exp. Med. 187: 1395–1402.
. 2000. Changes in the composition of circulating CD8+ T cell subsets during acute epstein-barr and human immunodeficiency virus infections in humans. J. Infect. Dis. 182: 451–458.
. 2002. Comprehensive analysis of CD8(+)-T-cell responses against hepatitis C virus reveals multiple unpredicted specificities. J. Virol. 76: 6104–6113.
. 2001. Functional heterogeneity of cytokines and cytolytic effector molecules in human CD8+ T lymphocytes. J. Immunol. 167: 181–187.
. 2002. Virus-specific CD8+ lymphocytes share the same effector-memory phenotype but exhibit functional differences in acute hepatitis B and C. J. Virol. 76: 12423–12434.
. 2004. Lessons from the study of T-cell differentiation in persistent human virus infection. Semin. Immunol. 16: 205–212.
. 2001. Skewed maturation of memory HIV-specific CD8 T lymphocytes. Nature 410: 106–111.
. 2009. The yellow fever virus vaccine induces a broad and polyfunctional human memory CD8+ T cell response. J. Immunol. 183: 7919–7930.
. 2007. Large-scale validation of methods for cytotoxic T-lymphocyte epitope prediction. BMC Bioinformatics 8: 424.
. 2005. An integrative approach to CTL epitope prediction: a combined algorithm integrating MHC class I binding, TAP transport efficiency, and proteasomal cleavage predictions. Eur. J. Immunol. 35: 2295–2303.
. 2008. Application of nine-color flow cytometry for detailed studies of the phenotypic complexity and functional heterogeneity of human lymphocyte subsets. J. Immunol. Methods 330: 64–74.
. 2011. Longitudinal analysis of the human T cell response during acute hantavirus infection. J. Virol. 85: 10252–10260.
. 2007. Activation/modulation of adaptive immunity emerges simultaneously after 17DD yellow fever first-time vaccination: is this the key to prevent severe adverse reactions following immunization? Clin. Exp. Immunol. 148: 90–100.
. 2008. Yellow fever vaccine induces integrated multilineage and polyfunctional immune responses. J. Exp. Med. 205: 3119–3131.
. 2012. Polyfunctional responses by human T cells result from sequential release of cytokines. Proc. Natl. Acad. Sci. USA 109: 1607–1612.
. 2011. A clinical microchip for evaluation of single immune cells reveals high functional heterogeneity in phenotypically similar T cells. Nat. Med. 17: 738–743.
. 2012. Cytometry by time-of-flight shows combinatorial cytokine expression and virus-specific cell niches within a continuum of CD8+ T cell phenotypes. Immunity 36: 142–152.
. 2005. HIV-1-specific IFN-gamma/IL-2-secreting CD8 T cells support CD4-independent proliferation of HIV-1-specific CD8 T cells. Proc. Natl. Acad. Sci. USA 102: 7239–7244.
. 2006. HIV nonprogressors preferentially maintain highly functional HIV-specific CD8+ T cells. Blood 107: 4781–4789.
. 2011. Relationship between functional profile of HIV-1 specific CD8 T cells and epitope variability with the selection of escape mutants in acute HIV-1 infection. PLoS Pathog. 7: e1001273.
. 2009. Human late memory CD8+ T cells have a distinct cytokine signature characterized by CC chemokine production without IL-2 production. J. Immunol. 183: 6167–6174.
. 2012. Single-cell level response of HIV-specific and cytomegalovirus-specific CD4 T cells correlate with viral control in chronic HIV-1 subtype A infection. J. Acquir. Immune Defic. Syndr. 61: 9–18.
. 2004. HIV-1 specific CD8+ T cells with an effector phenotype and control of viral replication. Lancet 363: 863–866.
. 2007. Human immunodeficiency virus type 1 (HIV-1)-specific CD8+ T(EMRA) cells in early infection are linked to control of HIV-1 viremia and predict the subsequent viral load set point. J. Virol. 81: 5759–5765.
. 2012. The early cellular signatures of protective immunity induced by live viral vaccination. Eur. J. Immunol. 42: 2363–2373.
. 2005. Live attenuated yellow fever 17D infects human DCs and allows for presentation of endogenous and recombinant T cell epitopes. J. Exp. Med. 202: 1179–1184.
. 2006. Yellow fever vaccine YF-17D activates multiple dendritic cell subsets via TLR2, 7, 8, and 9 to stimulate polyvalent immunity. J. Exp. Med. 203: 413–424.
. 1973. Yellow fever vaccine: direct challenge of monkeys given graded doses of 17D vaccine. Appl. Microbiol. 25: 539–544.
. 2012. 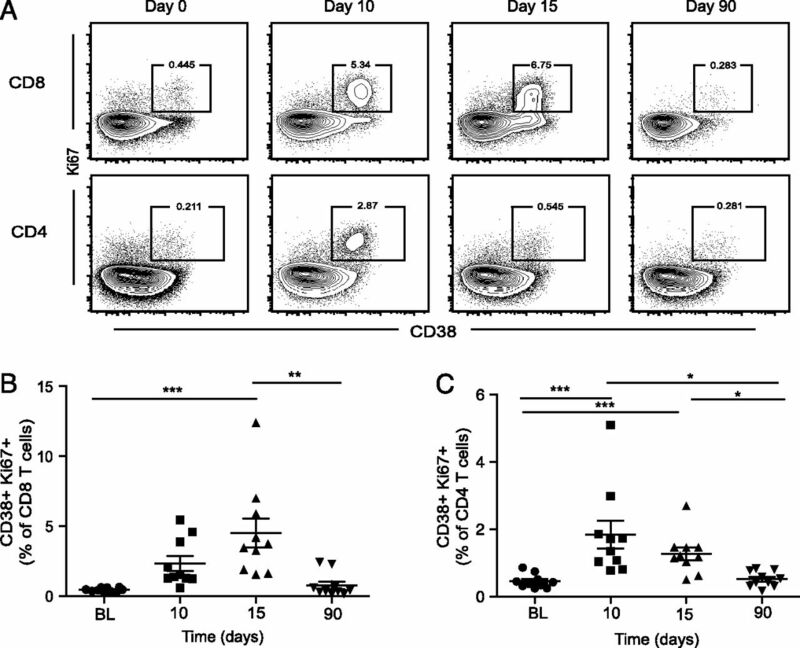 Regulatory T cells increase the avidity of primary CD8+ T cell responses and promote memory. Science 338: 532–536.